KaiserGreymon is a Dragon Warrior Digimon and a Mega-class Hybrid Digimon whose name and design are derived from "Kaiser (Deu: Emperor) Greymon". A Transcend Form Digimon with the power of fire exceeding that of Ten Legendary Warriors. It is said to contain the power of nine dragon veins flowing through the ground and can control the strength of nine dragons to rule Gaia with unfathomable power. 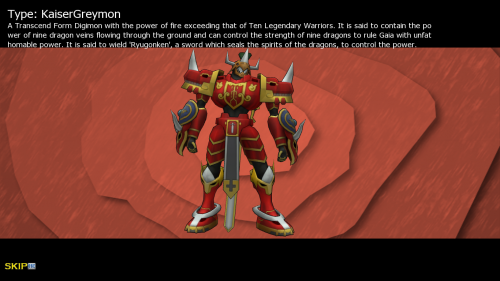 It is said to wield 'Ryuugonken', a sword which seals the spirits of the dragons, to control the power. 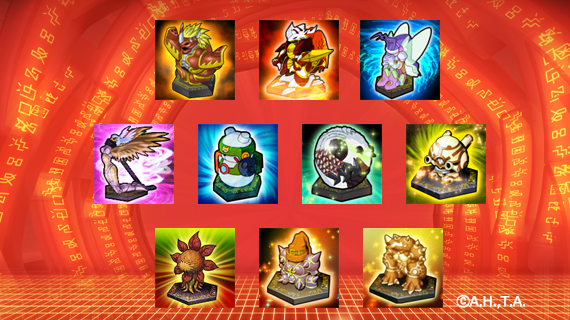 KaiserGreymon was added to Korean Digimon Masters on March 24, 2015. 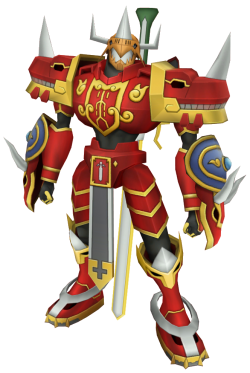 KaiserGreymon was added as a Mercenary Digimon to gDMO with the October 27, 2015 Patch. KaiserGreymon jumps up into the sky and forcefully slices opponents. Enryûgeki Fire attribute 6 seconds cooldown 980 DS consumed 1 skill points per upgrade Learned at Lv. KaiserGreymon fires flames from the tip of the sword as a crossbow. Kuzuryûjin Fire attribute 5 seconds cooldown 820 DS consumed 1 skill points per upgrade Learned at Lv. KaiserGreymon sticks Ryugonken into the ground and attacks a wide area by releasing eight fire dragon veins. The third skill is an area of effect hitting every enemy around KaiserGreymon. This page was last modified on 21 February 2019, at 23:07.